My friends at Robert Rose Publishing recently sent me several cookbooks from their Spring catalog to review and share some recipes with you. 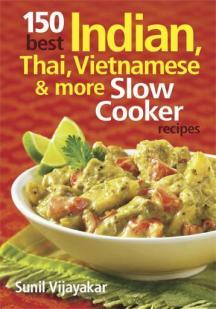 Today, I’m excited to tell you about 150 Best Indian, Thai, Vietnamese & More Slow Cooker Recipes by Sunil Vijayakar. I was immediately intrigued by the concept since I use my slow cooker year-round...even in warmer months. During summer, it heats up my kitchen much less than turning on my oven. Besides...a slow cooker is a busy cook’s best friend: assemble everything and let the slow cooker do the work for you while you take care of other errands! I ultimately decided to try a recipe I’ve always been curious about but had never cooked: chicken adobo. This is Filipino comfort food at its best: simple ingredients cooked over low heat until the flavors combine into something that’s way more than the sum of their parts! Chicken is essentially braised in a mixture of chicken broth, soy sauce, cider vinegar, lots of garlic, and a few spices. The initial prep takes about 20 minutes, and then the slow cooker does the rest. If your slow cooker has a timer and a stay-warm setting, you can put this on before work -- and dinner will be ready when you return home. I made this after work last night since Michael was working late -- by the time we were ready to eat at 900, the chicken was fall-off-the bone tender...and my kitchen smelled amazing! Step 1: Add the following ingredients to a medium saucepan: 2 cups chicken broth, 1/2 cup apple cider vinegar, 1/2 cup soy sauce, 1 tsp. freshly ground pepper, and 2 bay leaves (mine were small, so I used 3). Stir to combine and bring to a boil over med-high heat. Reduce heat and simmer the adobo stock for about 20 minutes. Step 2: While the adobo stock simmers, coarsely chop 15 cloves of garlic. Add 2 tbs. oil to a small skillet over medium heat. Add the garlic and saute until golden, stirring occasionally so it doesn't burn. This will take about 5-6 minutes. After the adobo stock has simmered for 20 minutes, add the garlic and oil, and stir well to combine. Step 3: Arrange 2 lbs. of chicken in the bottom of a slow cooker. I used skinned drumsticks and two skinless, bone-in chicken breasts. Pour the adobo stock over the top. Cover and cook on Low for 6 hours or High for 3 hours, until the chicken is cooked through. Remove the bay leaves before serving. Wowza...this chicken is bursting with intense flavor...garlicky, tangy, and a savory-salty kick from the soy sauce! After cooking in the adobo stock for 3 hours, the flavor permeated the tender chicken all the way to the bone. After cooking slowly on low heat, the garlic is mellow and delish! The only change I made to the original recipe was to use drumsticks and breasts in place of thighs since I prefer drumsticks and Michael only eats white meat. Other than that, I followed the recipe to the letter. The only accompaniment this dish needs is some steamed white rice to soak up the flavorful adobo sauce and a simple green salad with sesame-ginger dressing. 150 Best Indian, Thai, Vietnamese & More Slow Cooker Recipes contains tons of great high-flavor recipes in a variety of heat levels, broken down into the following chapters: Meat Dishes, Poultry & Eggs, Fish & Shellfish, Vegetables Fruits & Nuts, Rice & Pulses, and Accompaniments. If you’re interested in purchasing this fantastic cookbook, it can be ordered from Amazon. I can’t wait to try more of the recipes from this cookbook really soon...that Aromatic Shrimp Pilaf is really calling my name! !